On September 4, “The Under Armour (UA) Roadshow Featuring Stephen Curry” will take our reigning basketball MVP on his first tour of Asia, where he will visit Tokyo, Manila, Beijing, Chongqing and Shanghai. Stephen Curry, a man of relentless athletic devotion, will spread his love for the game to Asia’s best players and fans. Inspired by his travels, we’re spreading our love for the kitchen with these healthy Asian-inspired recipes—all under 375 calories per serving! Follow Stephen’s tour experience @UnderArmour and @UABasketball or join the conversation using #UARoadshow. Follow us into the kitchen by clicking and cooking any of the recipes below! Can’t find a good lower-carb option at your local take-out joint? Don’t worry, you can toss together this steak salad featuring lean flank flavored with a sweet and sour honey-lime marinade. The recipe calls for mango, but you can sub pineapple chunks if mango isn’t in season. Recipe makes 4 salads. Take a break from romaine! Asian-inspired salads take advantage of root vegetables like carrots to deliver a sweet crunch. The tangy, ginger lime peanut dressing makes this salad a perfect pairing for bland grilled chicken breast. A mandoline works best for this recipe, but you can also use a spiralizer or julienne peeler. Recipe makes 4 servings at 1 cup each. Five ingredients are all you need to transform fiber-filled, protein-packed edamame into a side-worthy salad. While cranberries and feta cheese aren’t traditionally used in Asian cuisine, we’re willing to make an exception for this sweet-salty pairing. Recipe makes 6 servings at 3/4 cup each. Throw this colorful salad in the face of typical greasy Chinese food! Crunchy cabbage, sweet carrots, lush avocado and nutty cashews are drizzled with a spicy peanut dressing. This makes an awesome entrée salad, and you can add chicken or tofu to up the protein. Recipe makes 4 servings. This homemade beef and broccoli stir-fry satisfies your take-out cravings without being a calorie bomb. Trimmed beef top round and crisp broccoli are cooked in a savory soy sauce base. We suggest serving over brown rice or a whole grain of your choice so you can also hit your fiber goal. Recipe makes 4 servings. Fire up those barbecue grills, because these beef kabobs are going to be worth it! Lean beef chuck gets the sweet and sour treatment before grilling seals in the juices. A simple garden vegetable sauté completes your summertime meal with zucchini, corn, green beans and tomatoes galore. Recipe makes 4 servings at 2 skewers plus 1/4 vegetable sauté. 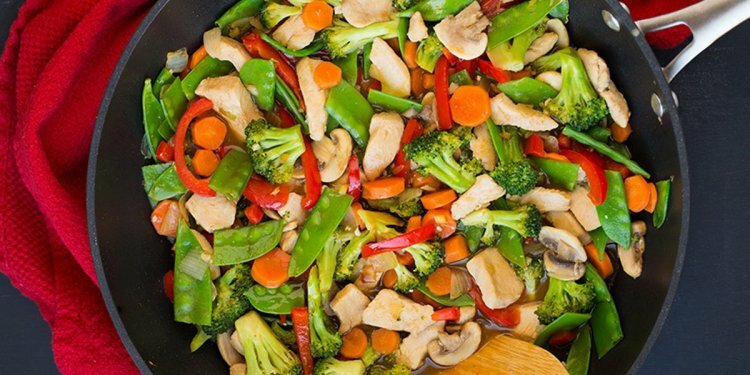 Craving a yummy stir-fry, but don’t want to be weighed down by grease? This smoky pork stir-fry could be your solution. Lean pork tenderloin gets its depth of flavor from smoked paprika and a drizzle of sesame oil. The stir-fry pairs well with brown rice or soba noodles. Recipe makes 4 servings at 1 cup each. Make a 25-minute stir-fry loaded with crunch that’s friendly for a carb-conscious crowd. Zucchini and carrots are tossed with a spicy mango-avocado dressing then topped with chicken and crunchy cashews. Recipe makes 6 servings at 2 cups each. Bump up the fiber, and cut out the gluten with this recipe for spaghetti squash pad thai. How? Replace traditional soy sauce with a gluten-free version and sub in spaghetti squash for traditional rice noodles (no spiralizer needed!). This dish still keeps all the flavor and comfort of the traditional dish. Recipe makes 6 servings at 3/4 cup each. Make mouthwatering shrimp and snow pea noodles using this recipe. Lean shrimp, crispy snow peas and tender noodles combine in a spicy soy sauce mix that’s sure to tickle your taste buds. Recipe makes 4 servings at 1 1/2 cups each.